I wanted to play it last year but I wasn’t old enough. Instead, I stayed disciplined and grinded cash games in MN all summer. I did pretty well while all the pros were gone. Since then I finished my degree, followed the WSOPc to play big cash games, grinded in Florida for three months, and booked a flight to Vegas for my first WSOP! I love Travelocity. It’s the simplest, cleanest app for finding flights. I found a one-way ticket to Vegas for $180. I would suggest buying the cheapest ticket you can and upgrading when you get to the airport and they haven’t filled first-class. Bring one carry-on bag and get the rest of the stuff you need when you land. It’s super easy and super cheap. Moreover, I didn’t want to get a round-trip ticket because I feel that it would restrict my scheduling flexibility. I also did a great job of preparing for housing and car rentals. I’m staying in a sick house with four other pros that I know from MN. We’re renting two cars, buying our own food, gambling on everything, and occasionally swapping action. It has been a lot of fun so far. Flying into Vegas at midnight was an awesome experience. I love how the city lights seem to go forever. Seeing the strip for the first time was really cool. Everything is ten times bigger than I expected it to be. I ended up going to bed early because I wanted to play the $1,500 Shootout in the morning. Walking into the Rio was an unsettling experience. It’s like all of the craziest people in the world decided to gather in one place at the same time. I suppose that’s great for me. I ended up safely registering for the tournament and getting to my table. I got a great table draw except that Phil Hellmuth was directly to my right. I thought the first hand we played was noteworthy. He completed the small blind for 50 and told me that he would call any raise that I made. I made it 200. He called. The flop came KT4ss. He checked and told me that the “young guns” always bet 225 in this spot. I ended up making it 225 and he called. The turn was a queen. He checked and told me to bet 500. I bet 450 and he called. The river was an ace. He checked and told me to bet 700. I felt like he was just going to assume that I was some crazy 21-year-old and end up calling with any two pair if I made a big bet. I decided to do something unorthodox and bet 525 into in 1750 and see if I could get him to level himself into thinking that I was going for really thin value. He ended up grabbing both of his cards, showing them to the rail, mumbling something about how I would never bluff in this spot, and folding. It felt great. Some of my friends think I should’ve shown the bluff. I definitely considered it. I just didn’t want to be that random tourist that made a bluff just for the sake of bluffing someone famous. Why would I want Phil Hellmuth to know what I’m capable of doing? I ended up mucking. Hopefully, I don’t regret it when I telling my grandchildren about my first Vegas experience. I little while later the blinds were 25/50. Phil opened to 150 from the HJ. I 3-bet from the CO to 500 with QQ. Phil made it 1000. I had him covered by a lot and ended up going all-in for 3,200, effectively. 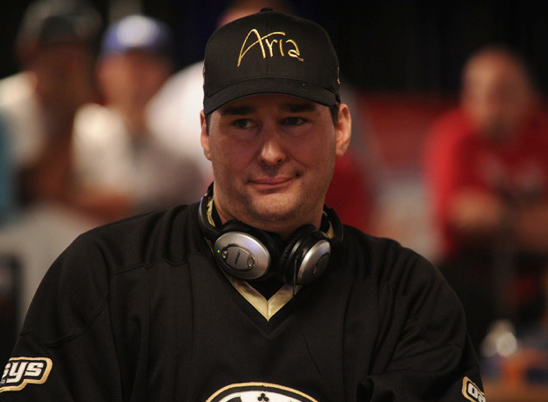 He did the standard “Phil-Hellmuth-piles-chips-into-the-pot-with-his-palms-when-he-has-the-nuts” and called with KK. Being the luckbox that I am, I spiked a queen and stacked him. I was hoping for an all-out Phil Hellmuth rampage, meltdown, f-word firing, blow-up. Then he calmly grabbed his coat and walked out of the room. What is going on? This is my first trip to Vegas. I coolered the Poker Brat. I want a blow-up… NOW!!! I deserve it. On break, I went to checkout the cash games. I was standing next to 5-6 of my friends from MN when Dave “Devilfish” Ulliott walked up to us and asked if we wanted to start a 5/10/25/50 PLO table with him. At least I think that’s what he asked because I don’t speak British. If you don’t know what I’m talking about you need to go on YouTube and look him up. Anyway, we politely said we couldn’t afford to play a game that big and went our separate ways. I went back to my table and ended up winning day one of the shootout, which is an automatic cash for $4,411. Day two didn’t go as well because I got the worst table draw… ever. I’m pretty sure I was the only guy at the table that didn’t have $1,000,000+ in live tournament cashes. I busted 46/948. Consequently, I will not be firing the 3K Shootout if the field is going to be that tough. The good thing was that I still had 7 minutes to register for day 1B of the Millionaire Maker. I registered, ran to my table, ran up a stack, and made it to day two. I ended up tragically busting in the second payout tier (AK < QQ all-in preflop for 110K). I went out 630/7977 for $3,466. Cashing in my first two WSOP events is cool and all, but I’m not really here to min-cash when I can be playing big cash games. The day after, a few of my friends decided to show me their “hit & run the strip” strategy. They said they were going to take me to each casino, let me crush the game for an hour, and then make me do the same thing at a different casino. We went to the Rio, Bellagio, Wynn, and Aria. At each stop we agreed to play for two hours or until we all won 50bb’s, whatever came first. Their “master plan” ended up working. We met several people we knew, convinced them to do the same thing with us, and ended up winning a lot of money. I won about $1,500 with the added benefit of seeing the strip for the first time. Overall, my trip is going great. I busted Phil Hellmuth, cashed in my first two events, saw the strip for the first time, won a couple thousand playing 5/10 Big O at the Rio… AND I haven’t even been here for a week yet. I think it’s gonna be a good summer.